Nottinghamshire history > The Great Houses of Nottinghamshire and the County Families: Bramcote Hall. The Smiths. 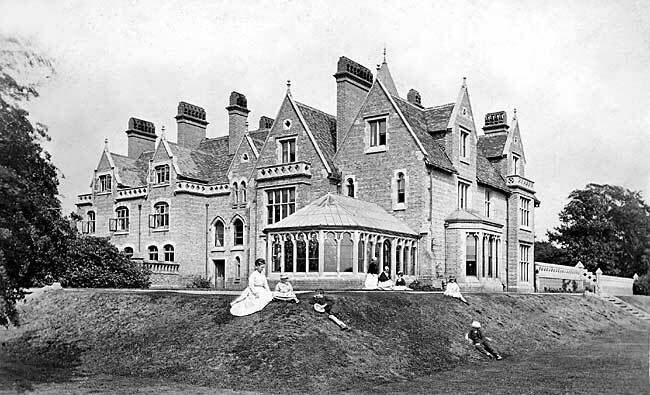 Bramcote Hall was built by Frederic Chatfield Smith, head of Smith's Bank in Nottingham, in the late 19th century. It was demolished c.1966. (photograph courtesy of John Gardner). THE Smiths, though the surname they bear is by no means an uncommon one, and might be answered to either by a Cabinet Minister or by the man who sells apples at street corners, are a family of considerable consequence and distinction, as I shall presently show. They have at one time or another furnished twenty-two members to the Legislature (eighteen Smiths, one Bromley, and three Caringtons). Seven of them sat in the House of Commons in one Parliament, facts the like of which I venture to think would not be disclosed by a most diligent study of the history of most other county families. I am speaking now of the family to which the late Member for North Nottinghamshire belongs, and not of legislators who through bearing the same name are not connected with him by ties of relationship. One of them, Robert Smith, was elevated to the Peerage of Ireland in 1796, as Baron Carrington, of Bulcote Lodge, and a year later to that of Great Britain under the same title, of Upton, in this county. Robert Smith was the friend of Pitt, and it is not improbable that he was raised to the Upper Chamber in recognition of the influence—numerical, if nothing more—which his family possessed in Parliament. There are no fewer than half-a-dozen branches of the Smith family upon whose coat of arms appear the three demi-griffins that are part of the Carington bearings. There are the Smiths of Woodhall, the Smiths of Sacombe, the Smiths of Selsdon, the Smiths of Dale Park, the Dorrien-Smiths of Tresco Abbey, and the Smiths of Edwalton, who merged into Pauncefotes, of Preston. These are all lineal descendants of a John Smith, of Cropwell Butler, a substantial yeoman who purchased a farm in that South Nottinghamshire village in 1622, from Sir Thomas Hutchinson, of Owthorpe. This, the earliest member of the family of whom there is any record, is supposed to have been the fifth son of George Smith, of Ashby Folville, in Leicestershire, a family of some importance. This, however, is only a matter of conjecture, and therefore not to be taken into account in tracing the descent of the family. The purchaser of Sir Thomas Hutchinson’s farm died in 1641, while his eldest son Thomas was yet a minor. The child was placed under the guardianship of a Mr. Burrows, of Nottingham, by whom he was probably apprenticed to Lawrence Collin, a mercer, and a man of note in the town at that time. In 1658 this Thomas Smith bought some premises at the corner of Peck Lane, where he originally carried on the business of a mercer, and at a later period he added a Bank. Here, then, we have the origin of the oldest country Banking House in England, with which the name of Smith has for generations been connected. The precise date of the establishment of Smith’s Bank is not ascertainable, but it was somewhere about the year 1688, during the lifetime of Thomas Smith. Some twelve years after the foundation of the Bank Thomas Smith died, having been twice married, first to Mary, daughter of John Hooper, of Somerset; and secondly to the daughter of his old master, Lawrence Collin, of Nottingham. During his lifetime he had amassed a large fortune, and he died in 1699 possessed of a good deal of landed property, including an Estate at Gaddesby in Leicestershire, which a short time before belonged to the Carington-Smiths, of Ashby Folville, the adjoining Parish. His eldest son, Thomas, succeeded him in the Banking business, which had largely developed during the lifetime of its founder, and had now reached some magnitude. In 1717 Mr. Thomas Smith, who had a large stake in Leicestershire, was High Sheriff of that County, and in this year the heraldic arms of the family were granted. Thomas Smith carried on the Bank at Nottingham until his death. in 1727, and he was succeeded by his two brothers Samuel and Abel, the former a citizen and goldsmith of London, and of Ashfordby, Leicestershire, and the other of East Stoke, in this county. In addition to the Gaddesby estate Mr. Thomas Smith owned the Manor of Broxtowe, in Nottinghamshire, which was his principal residence. At his death these two estates were sold and the proceeds divided amongst his five daughters. The brother, Samuel, who, as already intimated, became a citizen and goldsmith of London, died intestate in 1751, when his large personal property, amounting to two hundred and forty thousand pounds was divided amongst six children. The younger brother, Abel, remained in Nottingham, and carried on the Bank there. His eldest Son, George, of East Stoke, was created a Baronet in 1757, and the honour passed to the ancestors of Sir Henry Bromley, who now owns that estate. The younger son, Abel, applied himself sedulously to the business of banking, and threw into it a spirit of enterprise which resulted in the very considerable extension of the concern. In or about the year 1757 he established the London Bank, and soon after the Lincoln and Hull Banks, which with one at Derby established, I believe, at a later date, represent the great banking concern belonging to this wealthy and influential family. This enterprising and successful banker and financier represented Aldborough, St. Ives, and St. Germains, in successive Parliaments. His sons were Abel, of Wilford, Nottingharnshire, once M.P. for Nottingham, who died at the age of thirty-one, and whose grandchild Emily, married the late Bishop Wilberforce; Robert, who was created Baron Carrington; Samuel, of Woodhall, Hertfordshire, formerly M.P. for Leicester, and other Sons. Since the establishment of the London bank the elder branches of the Smith family have migrated to the southern counties, and they now hold large estates in Buckinghamshire, Hertfordshire, Kent, and Surrey. They have no estate of importance in Nottinghamshire, though they have been connected with the county for upwards of two hundred years. Mr. Frederic Chatfield Smith, of Bramcote Hall, the head of the Nottingham bank, and a magistrate and deputy-lieutenant for the county of his adoption, belongs to the Smiths of Sacombe, one of the six branches into which this large family is divided. He is the second of the four sons of Mr. Samuel George Smith, of Goldings, Hertfordshire. At one time three of these sons were Members of Parliament, and met on the Conservative side of the House of Commons. These were Mr. S. G. Smith, the elder brother, who represented Aylesbury; Mr. F. C. Smith, who represented North Nottinghamshire; and Mr. Rowland Smith, of Duffield Hall, who represented the Southern division of Derbyshire, for which county he is a magistrate and was High Sheriff, in 1877. The younger brother, who resides at Broxbournbury, in Hertfordshire, assumed by Royal licence the additional surname Bosanquet, that being the name of his father-in-law. 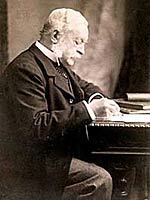 Frederic Chatfield Smith, (1823-1905) was MP for North Nottinghamshire until the county's parliamentary constituencies were reorganised in 1885. (photograph courtesy of John Gardner). A smaller house standing on the site now occupied by Bramcote Hall, was formerly tenanted by Mr. Wilmot, a connexion of the Chaddesden family, who sold it to Mr. F. C. Smith. The Hall was for a time occupied by Colonel Wright, but he left it and went to Stapleford, a house that has not the advantages of situation possessed by Bramcote. A strong liking for rural life—regarding sweet air, narrow field paths threading pastures bright with the colour of the commonest flowers, or fields of standing corn, from which the smallest wind chafes measured music; lanes that are either dusty or not, according to the humour of the weather, but always interesting in the months of spring and summer, and a host of other wayside charms, as the conditions of such a life—has taken me into most of the villages of this county. Yet with the memory of these visits still fresh and vivid, I cannot name any Nottinghamshire village which furnishes a more pleasing instance of the best type of English rural landscape than does Bramcote. It is in a measure remarkable that a village which is only five miles removed from the smoke and tall chimneys of a manufacturing town should be so favoured. Standing on a level and railed platform at the very top of Mr. Frederic Smith’s house at Bramcote, on a day when the distant landscape is not obliterated by mist, you may see many miles of country. Lincoln Minster, Belvoir Castle, the wooded heights of Leicestershire, and the more barren hills of stony Derbyshire, come within the range of vision, and the view is full of charm and variety. Both Mr. Smith and Mrs. Sherwin Gregory, who owns the land about here, and whose house is called Bramcote Hills, enjoy incomparable views. The hollows are studded with cottages here and there, and then there is the pretty village. 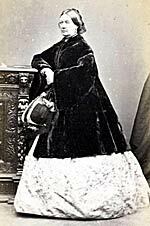 Mrs Sherwin Gregory of Bramcote Hills (died 1892) was the wife of John Sherwin-Gregory (photograph courtesy of John Gardner). On one of these eminences which give to the village a type of picturesqueness which is rare in this part of Nottinghamshire, stands Mr. Smith’s substantial mansion, and now that its owner has relinquished his connexion with the Legislature, and withdrawn to this extent at any rate from public life, you may fairly count upon finding him at home. Some of Mr. Smith’s friends could never quite understand why he gave up his seat for North Nottinghamshire, after a connexion with that constituency extending over a period of a dozen years, and dating from a determined and successful battle against a nobleman whose family had long been connected with the county by territorial and official ties. Seeing this broad-shouldered English gentleman, in the very prime of life, in every way fitted for public service, no one would think that he had found considerations of health sufficient to induce him to give up a seat in Parliament, which any number of influential people would be glad enough to fill. That his motive was a good one cannot be doubted ; a shrewd, clearheaded, cultivated man, who has devoted twelve of the best years of his life to the business of Parliament, and who has long been an energetic partner in a great and prosperous banking concern, would not make a movement of the kind indicated to gratify any idle caprice. Bramcote Hall is not now in the condition in which it was when by purchase it came into Mr. Frederic Smith’s possession. Its size, in the first place, was hardly proportionate to the requirements of a county family; its construction was quaint, not to say inconvenient. In the alterations that were made Mr. Smith carried out his own ideas, and by erecting a staircase here, a suite of apartments there and by other important alterations, all of them more or less ingenious, Bramcote Hall became the solid, comfortable country house of red brick that it is to-day. Mr. Smith is not a landowner, as I have already stated; his Bramcote estate is represented by a small park, in which are groups of trees—oak, elm, Scotch fir, and English chestnut, and a few acres of grass land beyond. His house is not a museum of curiosities; the pictures he possesses might almost be counted on one’s fingers. The family portraits are, I believe, in the possession of Lord Carrington; at any rate in the rooms of Bramcote Ball there are no canvasses that would afford the visitor any assistance in tracing the history of the family. But this comfortable country residence which presents all the outward signs of cultivated prosperity, and all the inward graces of English country life as it is enjoyed by families of position in the county, is not altogether destitute of examples of pictorial art. The few pictures that the rooms contain are not such as the art collector would pay fancy prices for, but they are well selected and good of their class. In the drawing room, with its small conservatory opening out at one end, there are a couple of bright pictures by Unterberger, representing under the favourable conditions of bright Italian sunshine and azure sky, scenes that are familiar to those who have travelled in Italy and have wandered from the way that is usually pursued by tourists. Another picture which hangs over the mantel piece in the dining room was produced by the same painter, who has here perpetuated a pleasant memory of Sorrento in light and airy colours. In the same room there is a charming picture, by Jacobson—a rich orange sunset suffusing a Norwegian landscape. There is nothing remarkable about these pictures, but they reproduce beautiful scenes and they reflect, may be, in some measure the taste of their owner. A cabinet in the drawing room contains some fine specimens of china, which have been got together by Mr. Smith at different times and in different places. Here I learned something of the distinctive characteristics of those precious bits of ware. One soon gets to like old china; -it improves on acquaintance. Under the guidance of a connoissieur quaintness becomes beauty, and primitiveness of form and design assumes an almost fascinating significance. Brought face to face with the barest rudiments of china lore, one recognises the artistic value of a Dresden drinking tankard, and becomes pleasantly reconciled to tea cups of Crown Derby, so unlike the crockery which graces modern tables. Here in this cabinet there are some interesting examples of Dresden, Derby, and Chelsea china in a variety of interesting forms, which have been collected with much patience and artistic taste, and at a great deal of expense. There is much to be learnt from an inspection of a fine collection of old china, and one gets the wholesome impression that those who are at so much pains and expense to obtain it, are not altogether influenced by a prevailing craze. At any rate Mr. Smith’s collection of china, which has spread to other parts of this house, certainly deserves a place in any notice of Bramcote Hall. Some portion of it is preserved in an oak cabinet which originally formed part of an old place at Rempstone on the borders of this county, and now stands at the extremity of the entrance hall, at Bramcote. Bramcote Hall in the early 1960s. Photograph courtesy of Julian Pedley (julian@pedleyonline.com).